I wasn't sure were to post this but here goes. Today was the first time we've shot Suzys build with the new 308 barrel. We had a problem that was corrected by cut the releif on the firing pin threads so it would screw in deeper. Here are some picture of what happened on the bench today. Luckly I didn't get hurt. I had a primer perferation on shots 3 and 4 that were so violent that it destroyed the firing pin spring. I had something spray my face -- 2 shots and I figured out my firing pin protrusion was to much. I cut the thread releif so I could screw the FP in deeper. The brass circle in the parts dish I pryed out of the bolt head. I don't think it was the ammunition as I've had no other problems. SHTF (Stuff Hits The Face) Yikes.. Glad your ok Shep. What ammo was that? Hope that wasn't my spring that did that..
That's Russian blue box surplus. I've been shooting it regularly and have had no problems. No Mark -- that's a standard spring. I tried your idea because it works great. Take care of your self, brother, we don't want anything happening. Hmmm if you look at the close up photo counting from left to right primer number 4 is quite interesting. Almost looks like it's a really hard material and it's mushroomed out taller than the firing pin mark. I take it this was all the same box of ammo correct? Bottom line here is I'm glad you're ok.
Jerry, I'm glad to hear that you're alright!! I'm guessing that you didn't have this problem with the UK-59 barrel that was originally on there... I'm curious, what do you think happened to cause the change? I sometimes have to cut the bolt face to correct the head space. This makes the FP protrusion more. I had the FP screwed in as deep as it would go and like Greg I use my micrometer eye ball and it was off that day. I don't have a FP gauge so I will use my dial caliper and measure perfectly from now on. I have no problems fire the Russian blue box ammo out of my 308 bore rifle. It mics out to 309 diameter. I read so much on reloading in the last 6 or 7 months that I've changed my ideas about .001 oversize, plus my reamer cut a forcing cone in the bore. Other than the primer blowout the cases show no signs of overpressure. I going try so low pressure hand loads and see if the problem has been fixed. I've been measuring the protrusion on most of the mosin's that I come across. I have come up with a compilation of ranges, and it's quite interesting. The range of my Mosin's goes from 0.070"-0.092"... The least amount of protrusion I've seen was a 1942 Tula that had 0.069" protrusion. I've never seen a Finn with less than 80 thousandths, while the Russians usually fall between 0.070"-0.080". I've fired all my Mosins and I haven't had an issue with either light strikes, or puctured primers. The most firing pin protrusion that I have is on a 1929 Tula Dragoon that is doudle 'D' and double [SA] marked. @ 92 thousandths, it's probably getting close to being too far out, but I haven't had an issue with it yet. I'm going to be working on rfranks82 UK-59 build... he posted a week or so ago, and he's having issues with light strikes. The smith that put his rifle together machined the bolt head also, but he must have taken some off the firing pin too. 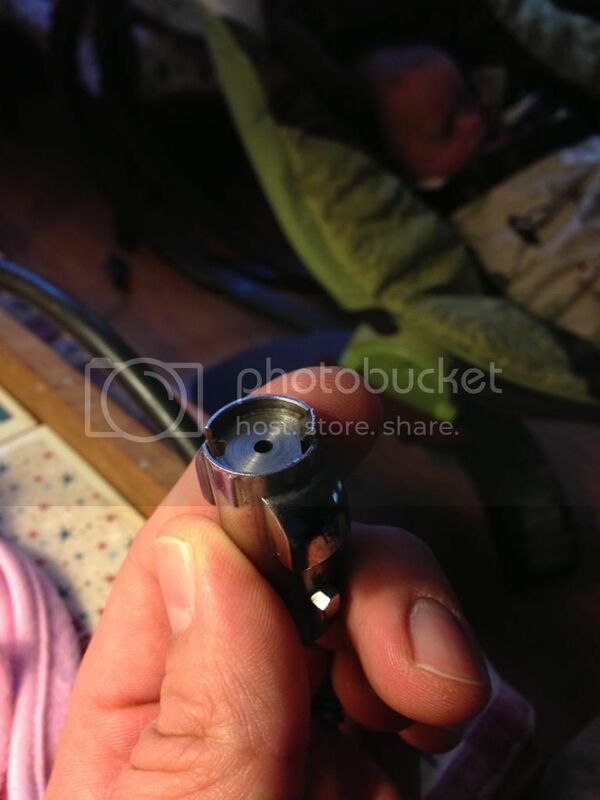 Here is a pic of the bolt head that he sent me. The problem is that even though he backs the firing pin out, the protrusion doesn't come out. The firing pin MUST be hitting the bolt head, and the interference from the bolt head isn't letting the firing pin adequately protrude. Anyways, that whole project will be another thread... but I though you might appreciate the workable 'range' of protrusions. Jerry, I am just glad you didn't get hurt. I keep you in my prayers. Looks like someone is watching out for you. I have built 11 Mosin Heavy barreled rifles over the last 2 1/2 years --- 7 UK-59 barreled heavies --- Grimstods Lothar Walther heavy barreled rifle --- 3 308 heavy barreled rifles. I was working on 3 at once. I checked the head space on Suzy's rifle and it's not in spec. Passes only the field gauge test and that is not how I work. I must have mixed up some parts on the bench when I was building hers. When I set these rifles up I set the head space as tight as I can get it -- especially on a chamber that I cut. It produces excellent fired brass cases with zero deformities. The barreled action I sold -- the buyer called and asked -- why can't I chamber fired brass in this new gun. Answer -- the brass he tried to chamber was shot from a different rifle. The standard store bought 91/30 or whatever the number rifle has had a lot of rounds fired thru it. The chamber is safe but far from new specs. Well for now I have to go thru my collection of bolt heads and hope to find the missing.